Our training will benefit social workers, offender managers, police officers and probation officers working with internet offenders who are concerned with their assessment and management, as well as others who need to be aware of the risks internet offenders present and how to manage their risk, such as health workers, faith communities, community groups and those responsible for housing. 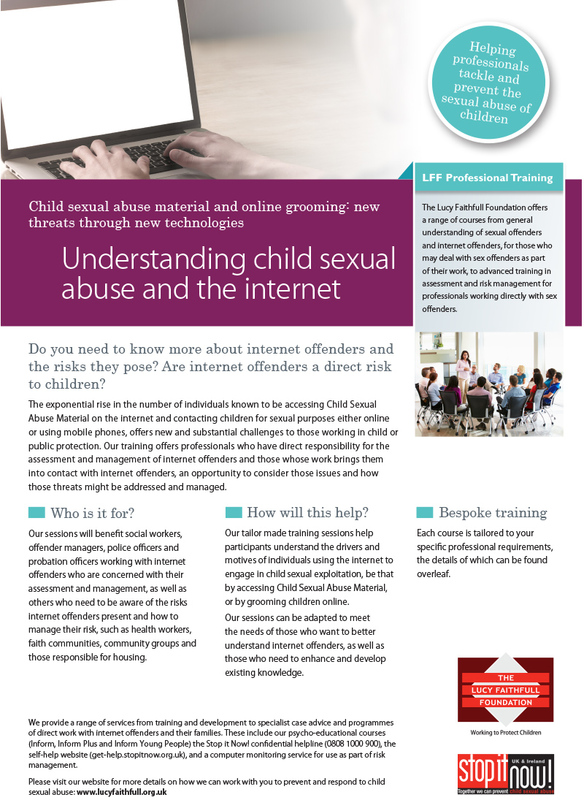 Our tailor made training sessions help participants understand the drivers and motives of individuals using the internet to engage in child sexual exploitation, be that by accessing Child Sexual Abuse Material, or by grooming children online. Our sessions can be adapted to meet the needs of those who want to better understand internet offenders, as well as those who need to enhance and develop existing knowledge. Understanding and managing specific risks. We also provide a greater awareness of the range of possible responses when internet offending comes to light and how best to respond. Throughout, you will be given the opportunity to explore and discuss the issues related to your work situation using your own case examples and practice. "Anyone working with children and young adults should do this course. Trainer very knowledgeable." "Helped to remove some myths/pre-conceptions regarding internet offenders, their risks and sexual interests." "Excellent training, very relevant and helpful in my practice. Interesting research and well presented. Really enjoyed this training - would like more of the same."